Andrea and I had a good weekend of Warhammer. Saturday we hit up Pandemonium for a few games of Warhammer to give her a better idea of how much goes in in larger games compared to small, 750 point skirmishers. Sunday we hit up GW really quick and picked up a box of Bloodcrushers for her Daemon army. They really are fantastic kits. First game was an Adepticon Team Tournament practice game for my partner Nik and I. I have decided to try and bring Ogres along with his Dark Elves, so we had a practice vs more Ogres and Daemons. Things did not go so well for our team as Nik's Spearmen block and Sorcerer got Dweller'd off the board, my Ogres got eaten up by Bloodletters, and my Mournfang were seemingly ineffective. I still want to give the composition a chance, but worst case scenario I can switch back to Skaven for the Team Tournament. Then we practiced a straight up 2500 point game with possible tournament lists for next month. 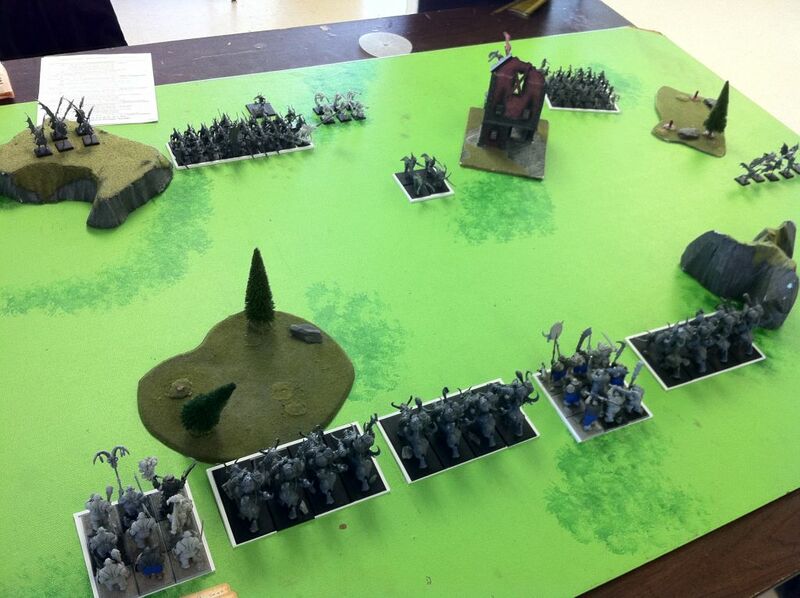 The Daemons switched up to use Shadow magic for the second game, and I brought my triple Mournfang list. I wanted to keep all three Mournfang within the range of at least the General, BSB, or hopefully both. My Ironblaster was on the far right flank hoping to get a shot on the Bloodthirster first turn, but the Daemons rolled to go first and Billy (the Bloodthirster) was able to take cover behind the building. The Shadow magic hurt early as critical debuffs on my Mournfang made me gun shy and less eager to move forward. From here the Daemons ate me pretty easily. Daemonettes moved to the side of my line and smashed into a Mournfang block, boosted up by ASF from the Herald, and a nifty spell called Mindrazor. The chewed through the entire units 12 wounds and 2+ armor save like they were nothing and wiped the first unit of MF on the second turn. I was able to get off 2 long 10" charges on the Bloodletter horde the next turn and just about wipe them out in a single round. Mournfang and Ogre units together will do that. But as I finished them off, Fiends and Daemonettes were killing off my General's unit elsewhere, and Billy was circling around, catching cannon balls, and setting himself up to finish off stragglers... which he did. In the end I was tabled. I think I killed off the Bloodletters, Daemonettes, and some chaff... but didn't touch the expensive support units of Fiends and Flamers, or the Tz Herald on a disc or Bloodthirster. Big win for Daemons as the Ogres go down in flames. Also in an update, we finished up all 5 Fiends in the unit. I posted them to my Twitter feed this weekend, but here they are for the blog.